How to watch Blu-rays, DVDs and different videos on HTC Evo 4G? Home » How to watch Blu-rays, DVDs and different videos on HTC Evo 4G? HTC Evo 4G features a big 4.3-inch touch screen, which is bigger than the 3.5-inch display of iPhone 4. Only one other Android phone has a screen that comes close, the newly-announced Motorola Droid X, which has a 4.3-inch touch screen as well. The 4.3-inch touch screen with 800 x 480 pixel resolution makes HTC Evo 4G convenient and comfortable for users to visit the internet, touch emails, view photos, read newspapers, books, magazines, and watch any kind of video, from movies, TV shows to podcasts, music videos and more. Additionally, HTC Evo 4G comes with storage capacity of 8 GB microSD card included, and supports up to 32 GB expansion, which delivers it ability to carry more movie files when travel. You can imagine how fantastic it is to watch Blu-rays, DVDs and different videos on HTC Evo 4G. To achieve the goal, this article intends to give a solution on how to rip Blu-rays, DVDs and videos to HTC Evo 4G compatible file format. If you are looking for such a solution, just feel free to read it. 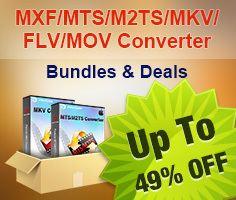 The software we will use is Pavtube Blu-Ray Video Converter Ultimate. How to rip Blu-rays, DVDs and videos to HTC Evo 4G compatible file format? STEP 1: Step 1: Download Pavtube Blu-Ray Video Converter Ultimate, install and run it. Launch the app to convert Blu-rays, DVDs and videos to HTC Evo 4G supported file format. Once run it, click “Add Video” to load your video files like MTS/M2TS, MKV, MOV, TOD, TiVo, etc. and click “Load BD/DVD” to load your DVD and Blu-ray movie files. If you wanna combine several files into a single file, just tick off the checkbox “Merge into one file”. To rip Blu-rays, DVDs and videos to HTC Evo 4G compatible file format by using Pavtube Blu-Ray Video Converter Ultimate, you need select an output format specialized for HTC Evo 4G from the multiple output formats. 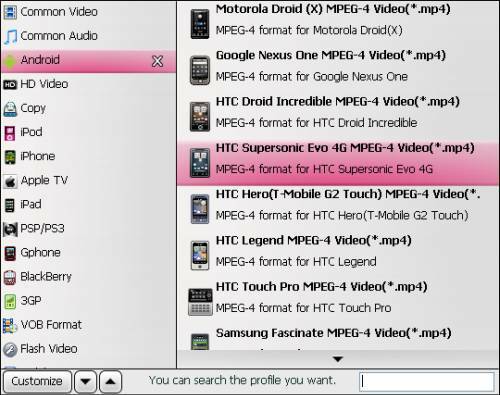 Click on the pull down menu of “Format”, and follow “Android”> “HTC Supersonic Evo 4G MPEG-4 Video (*.mp4)”. 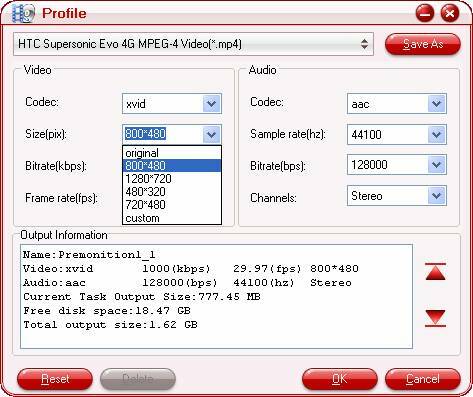 As you see, the application offers a wide variety of formats developed for smartphones running Android OS, like Motorola Droid X, Nexus One, and more, to watch Blu-rays, DVDs and different videos on HTC Evo 4G, “HTC Supersonic Evo 4G MPEG-4 Video (*.mp4)” is proper for you. The Blu-Ray Video Converter Ultimate allows users adjusting audio and video parameters when rip Blu-rays, DVDs and videos to HTC Evo 4G compatible file format. Click “Settings” button, then you are able to set your own settings in the following window by changing codec, aspect ratio, bit rate, frame rate, sample rate and audio channel. Click the big button “Convert” to rip Blu-rays, DVDs and videos to HTC Evo 4G compatible file format. Once the conversion task is finished, you can click “Open” button to get the resulted files for your HTC Evo 4G with ease. Now you are ready to watch Blu-rays, DVDs and different videos on HTC Evo 4G whenever and wherever. Read More: How to rip Blu-ray and DVD discs for playback on HTC Evo 4G?